The Gospel reading for this day is from the sermon on the mount. Jesus is instructing the people. 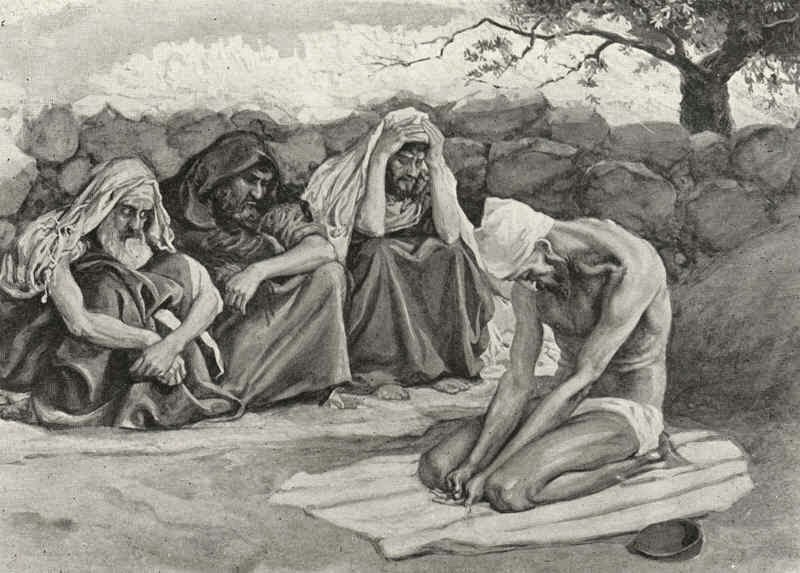 Today he deals with the three Christian disciplines of fasting, prayer, and almsgiving. He says, “When you give to the needy… when you pray… when you fast.” He does not say if. We are commanded by God to pray. We are commanded by God to care for our neighbor. It makes sense that Jesus would say “when”. Those are clear-cut, easy cases. Christians will do those two things. And we see the church structured around those things – prayer and help for the needy. But are we commanded to fast? It’s assumed by God himself that we will. But we don’t have the clear command. Just the assumption that we will do it. Jesus assumption here is explained throughout the letters of Saint Paul, where he talks about disciplining the body, bringing it into submission. Are your appetites lord of you, do they rule over you? Today it’s common to speak of addiction as an illness. As if the person had no responsibility for their troubles. You also hear talk of a person’s self-identification as the ruling factor in their behavior. There are many who claim that whatever you feel inside is what you must express outside. Leave no appetite unfilled. No itch unscratched. That is the way of the world. Thus, Saint Paul in 1 Corinthians. Not that we earn anything by it. Jesus earned our salvation on the cross. But it is a way of training our bodies in putting to death the old Adam. How? God makes us feel hunger so that we would know it is time for nourishment. When fasting we feel that hunger pain, and then say, “No” to it. As we will hear Sunday, “Man shall not live on bread alone, but by every word that proceeds from the mouth of God.” So, what would a biblical fast look like? Sunday we’ll hear about Jesus going 40 days and nights without food. That’s not what we’re talking about. A fast does not mean eating no food. It means eating less food, less often. But let’s be clear – it isn’t about dieting or losing weight. It is about putting to death the desires of the flesh. In the early church, they saw fasting as a preparation for persecution. Christians could be imprisoned or killed. They could be tortured for the faith. Fasting was a way of getting used to being uncomfortable – it was a training so that in times of persecution, you would not fall away. Remember the parable of the sower from a couple of weeks ago. If we think following Jesus is easy, we run the risk of being like that seed planted among the rocks, that grew up quickly, but in time of testing fell away. Fasting help us focus our minds on the things of God. It gives time for extra prayer, it frees up money for extra almsgiving – extra help for the needy. While we always have the command of God to take up our cross daily and follow him, while we are always commanded to pray, and to help the poor, the season of Lent stands as an opportunity to engage in these Christian disciplines in a more focused and significant way. We have extra services each Wednesday to hear the Word. You can spend a few extra minutes each morning or evening reading the Word of God and praying. And it is also a time of fasting. For the Bible teaches that the flesh fights against the Spirit and does not receive the things of God. Our sinful nature desires sinful things. And without the grace of the Holy Spirit, we would become enslaved to those passions. Fasting subjugates our sinful flesh by telling it that it will be deprived for a season of God’s good gifts of food, sleep, or other comforts, so that the things of the Spirit can have the priority, which is to be the case even when not fasting… the life of the Christian is to be one of continual repentance, that is, turning away from the sin and the corrupt pleasures of this fallen world and seeking the wholesome goodness of God’s love and forgiveness revealed in Christ Jesus, our Savior. Fasting must always include a recognition of and sorrow over the sin in ourselves and in the world. And having so recognized sin for what it is – a degradation of our humanity and a solemn violation of God’s good and gracious will – we seek to turn away from sin and seek the wholesome righteousness of God. So let me say it again…fasting is training in the mortifications of the flesh, and the exercise of repentance and prayer. Fasting is not dieting, or budgeting, or adopting a regimen of self-improvement. The Bible calls fasting “afflicting oneself” and that for the sake of God and the neighbor. And one other thing, if you refrain from food or other things that cost money, give away the money you saved to the poor. I would even say, don’t place it in the offering plate. Give it away completely. One last word of encouragement, be patient with yourself if fasting is new. You will be hungry or tired or whatever, depending on the fast you choose. And also know, you may experience greater forms of temptation. This is to be expected. The devil, the world, and our sinful flesh do not want us to hallow God’s name or let His kingdom come to us. Remember, we undertake this discipline for the sake of God’s kingdom where moth and rust cannot destroy the eternal treasures given to us in Christ Jesus. From ancient times the season of Lent has been kept as a time of special devotion, self-denial, and humble repentance born of a faithful heart that dwells confidently on His Word and draws from it life and hope. The Lord bless you all during this Lenten season as you live out the righteousness which Christ has given to you. I’m listening to some lectures that +Kenneth Korby+ gave on Confession and Absolution back in 1998. It was actually a continuing education class – a shortened version of a class he taught a number of times at the Saint Louis seminary in the 1990’s. And what a class it was. Even after 20 years in the ministry, and much studying of the topic, Korby teaches me to think in ways I had never considered before. I’ve had the recordings for a long time – over a decade – but I wanted to finish Catechetics first before I dived too deeply into a new project. Ultimately, the topic of the lectures is not the point of my post. The history of these recordings is. One of the men scheduled to attend had something come up in his congregation. He had to cancel. Korby mentions it on the tape. He says that he prayed God would allow him to come, but God had other plans. Indeed He did. One of his friends made the recordings. They were only supposed to be for him – with maybe a couple of other personal copies made, free of charge, for some others. Korby was, at the time, working with CPH to make a video series on the topic, and he didn’t want these recordings to ruin that. It would have been a much higher quality – both the presentation and the technical aspects would have been top notch. Alas, it was not to be. Korby would suffer a stroke in 2001 that robbed him of his ability to speak. The eloquent voice of the prophet was silenced. But the recording remains. A recording I would not have, were it not for whatever congregational problem that pastor had to face in 1998. Cancelling a Korby class at the last minute – what a disappointment it must have been. I feel badly for that pastor. But for the sake of the church, Korby’s lecture – I think it may have been the last time he did the full class – has been preserved. It’s still available in a few district A/V archives. That’s how I found it. Now (DV) it’s the subject of my next major project. I don’t know when/if it will be finished. But I plan on using it for my continuing ed for the next few years at least. Lectures beget notes with scriptures to dive into, confessional citations to examine, books to read, rabbit trails to head down, etc. And then writing. It’s a long path, but I always come out the other side a better pastor and teacher. Thanks to an unforeseen problem more than two decades ago, and prayers answered differently than we wished, but always yes according to God’s will, I have this new project before me. I’m grateful for that. And I pray it will be a blessing, however it works out. It always is. I was asked for previews – or at least the Table of Contents. You can find previews HERE, HERE, HERE, HERE, HERE, & HERE. But the Table of Contents I have not posted. Until Today! Hardcover and Paperback available at Lulu. Use code ONEFIVE to get 15% off through Thursday! 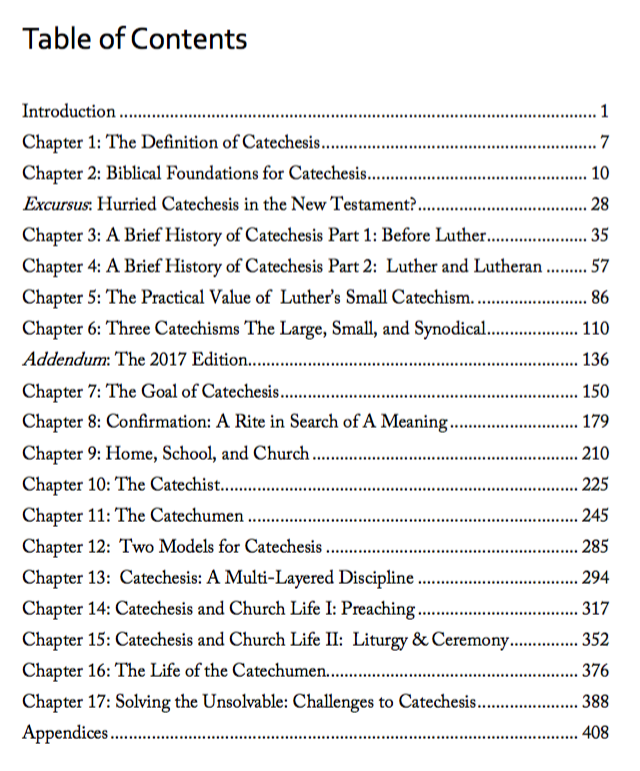 Catechetics: First Review “Landmark volume”! Catechetics: Fixing Confirmation, is a necessary book. 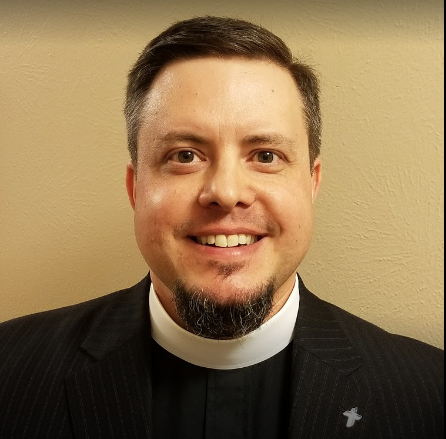 Recapitulating, updating, and improving upon the standard works on the topic, Catechetics explains how Confirmation in The Lutheran Church–Missouri Synod reached its current state, and how a distinctly Lutheran catechesis can begin the work of repair, patiently bearing fruit over the next generations. Lutheran parents, pastors, educators, and church and school leaders would benefit from a return to Lutheran catechesis, wider use of the Large and Small Catechisms of Martin Luther, and collectively reading this landmark volume. This book will be especially encouraging to classical Lutheran educators! Faithful, honest, frank, yet constructively helpful and practical, Catechetics: Fixing Confirmation deserves a wide distribution, readership, and application. Use the code ONEFIVE and get 15% off your order. It’s available in hardcover ($45 HERE), and paperback ($36 HERE). 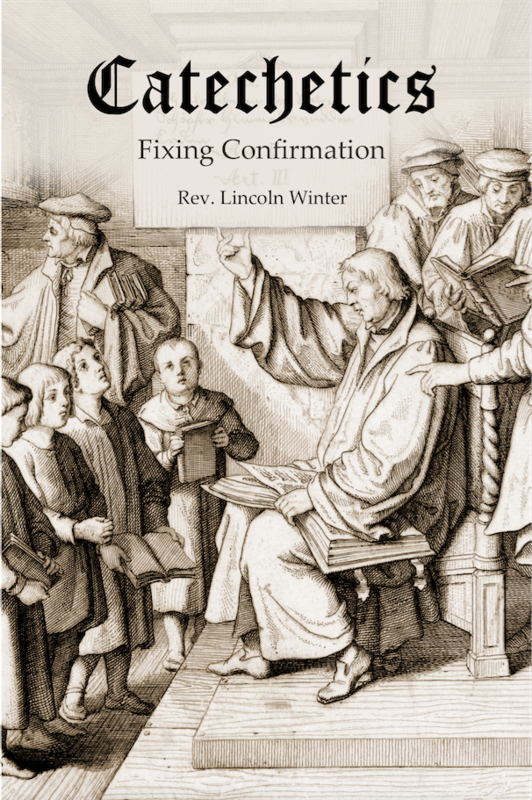 Catechetics: Fixing Confirmation is now available! Head over to Lulu and you can order in paperback for only $36 (Click HERE), or hardcover for $45 (click HERE). You won’t want to miss the book that Pastor Paul Cain called “necessary… a landmark volume.” Order yours today! UPDATE #2: Now through Thursday March 7, get 15% off with the code ONEFIVE. Order today! Ceremony serves primarily to teach. Whatever we do will teach. As such, ceremony is not neutral. Having vestments may be a neutral thing of itself. But not having vestments sends a message. Wearing a clerical collar sends a message, as surely as not wearing one does. Whether one message is of the same value as another is certainly a matter of debate, but it can not be denied messages are sent. In this regard, there are several explanations of the Divine Service which are helpful for explaining the basic meaning of each part. Most of those are explanations of the Words of the Divine Service themselves, rather than the attendant ceremonies. The specific ordo is not, properly speaking, ceremony. So, the reading of the Holy Gospel at the Divine Service is not mere ceremony, and its deletion could be considered in no way neutral. To omit the words and deeds of our Lord at the Divine Service is an overt doctrinal act, not merely a change in custom. The words of the Divine Liturgy are properly attended by certain ceremonies. To continue the above example, among our parishes there are varying ceremonies attendant to the Gospel reading. In many parishes, the Gospel is read from the lectern by the pastor. In some it is read from the horns of the altar, which is the more ancient practice. In other parishes, and in many parishes on festivals, the Gospel is read in the midst of the congregation. These various ceremonies all teach. The Lectern is a spot set apart for the reading of the word, although in ancient usage, it was set apart for the services of the Word (Matins, etc. ), and the readings for the Divine Service were done elsewhere. The horns of the altar tie the Word to the Sacrament which is there celebrated. The reading of the Gospel in the midst of the congregation emphasizes “the poor have the Good News preached to them”—the Gospel is not the property of a special magisterium, but of all the people. God has come among us, and so His word is proclaimed in our midst. Any or all of these ceremonies may be profitably used with instruction. But the Gospel reading must be read somewhere and in some way. If the pastor believes he has fulfilled his role simply by pressing the play button for a pre-recorded audio Bible, and leaves the Nave/Chancel to get a drink of water each Sunday during the playing of the Gospel, something very disrespectful is being communicated. It is not the mere recitation of vocables which is important in the Gospel reading. The ceremonies attendant to it will teach. For centuries after the Reformation, the Roman church refused to use the vernacular for their services. Adherence to the laws and traditions of men was more important than the Gospel being proclaimed. The ceremony certainly taught more than the strange sounds made by the priest. Whether this story is true or not it is nevertheless in accordance with the faith. With this illustrative story the fathers wished to admonish the youth to revere the indescribably great miracle of the incarnation. They wanted us to open our eyes wide and ponder these words well. Luther sees great value in the ceremony of kneeling during the recitation of the Creed. The man in the story was making a firm statement about his belief, even though he was not aware he was doing so. It is worth noting that few Lutherans today practice the same care and reverence during the creed. While wearing hats during the Divine Service is not an issue, physical movement like kneeling or genuflecting is no longer the norm in most places. Does our current ceremony teach youth to “revere the indescribably great miracle of the incarnation”? If we returned to this more ancient practice, what would it teach to our children regarding the significance of the Word made flesh? 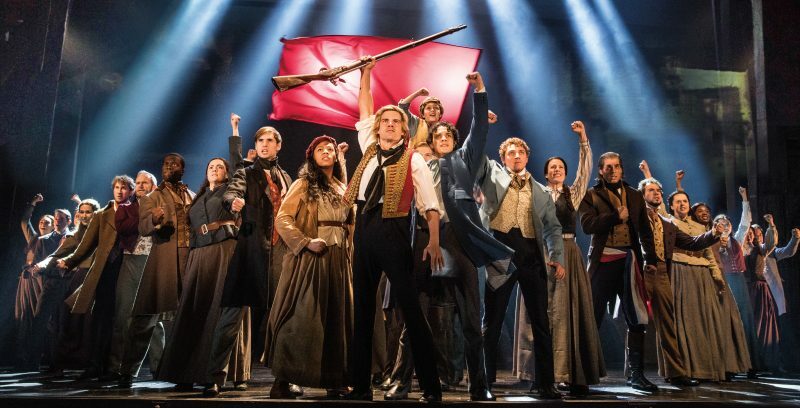 I can’t believe I missed the chance to call yesterday’s preview the ante-penultimate. It’s a word that is not used enough in our world. Too late. We’re already at today, which is the penultimate. Third, after you have so taught them this short catechism, take up the Large Catechism and use it to give them a broader and richer understanding. Here enlarge on every individual commandment, petition, segment, explaining in each case the various words, uses, benefits, dangers, and hurts involved, as you will find them amply described in many a book dealing with these topics. Stress especially that commandment or any other specific part of the catechism doctrine which your people neglect most. The question arises, as it often does in Lutheran practice, whether this section of our confessions, to which all pastors and congregations must pledge themselves, is prescriptive of our practice, or merely descriptive of Luther’s practice. Given what has been said about the progressive method, and its failure to properly catechize, even if one is inclined to treat Luther’s Preface as descriptive, one should certainly give the description a place of honor when considering curricula. According to Luther’s method, the Grammar of Theology is learned first. The basic texts of the Ten Commandments, Creed, Lord’s Prayer, as well as the verses which institute the Sacraments form the basis for all catechesis. Next, the pastor teaches the meaning of those texts. What does it mean not to murder, or commit adultery? What does Baptism give, and how does it have significance for daily living, etc. Finally, a more expansive definition is given. The first phase uses the words themselves, without adornment. The second allows for brief explanation. The third phase is the place for rhetorical flourish. This is a much more natural progression for instruction than the usual method of waiting until a child enters adolescence and then attempting to do all three phases of instruction at the same time.